Imagine in Paris, across the river from the Eiffel Tower, a palace as magnificent as the one at Versailles, with a park covering about half of the present 16th arrondissement. This was Napoleon’s vision. In 1811, work began on a great imperial dwelling on the hill that is today known as the Trocadéro, where the Palais de Chaillot (built in 1937) now stands. 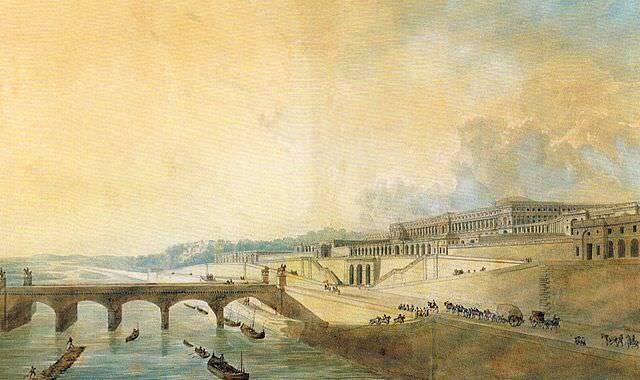 Intended as a residence for Napoleon’s infant son, the planned complex was known as the palace of the King of Rome. In January 1811, 20 million francs were allocated for the palace’s construction. When Napoleon François Charles Joseph Bonaparte, also known as the King of Rome, Napoleon II or the Duke of Reichstadt, was born on March 20, 1811, work had already begun. In the early 1800s, the Trocadéro was the village of Chaillot, outside of Paris. The idea of situating the palace of the King of Rome there was apparently sparked by a remark by Fontaine. George Sand writes fondly of visiting her aunt and uncle at Chaillot in 1807, when she was a child. George Sand’s uncle sold his small property to the French government, as it was on the site destined for the palace. Others had to sell as well. The hill had a convent on it, which was levelled to make way for the excavations. One enterprising resident held out a little too long. Percier and Fontaine repeatedly had to amend their plans for the palace of the King of Rome. In its grandest incarnation, three levels of terraces were to rise up to the palace from the Pont d’Iéna, culminating in a vast courtyard and a 500-metre-long colonnade. The main body of the palace was in the shape of a large parallelogram, the centre of which would be occupied by an immense salon, suitable for hosting large fêtes. Two small courtyards, ornamented with fountains, one on each side of the grand salon, would have highlighted the large staircases, the chapel, the theatre and the galleries leading to the rest of the palace. On the north side, flowerbeds and gardens would have extended to the Bois de Boulogne. The Canal de l’Ourcq was to be diverted to bring in water. Grand boulevards would flank the palace and gardens. A pheasantry and a menagerie were part of the plans. Besides the imperial court and a large staff, the palace would have accommodated 400 horses and 80 carriages. 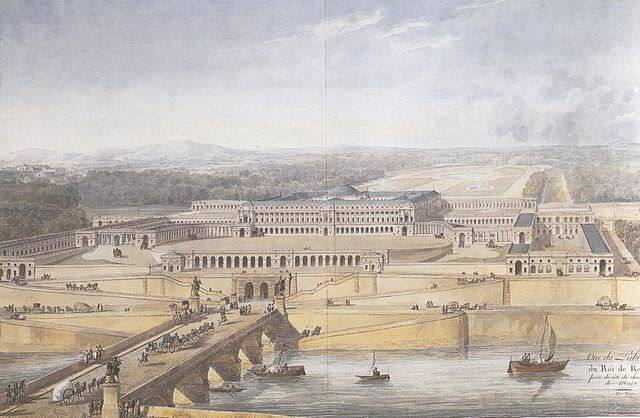 In March 1812, Napoleon added the idea of constructing a palace of the arts, an imperial university, state archives and barracks on the left bank of the Seine, opposite the palace of the King of Rome. Napoleon’s disastrous campaign in Russia put an end to these dreams. In light of the dwindling resources of the government, work on the palace at Chaillot slowed. A smaller palace being built at Rambouillet was given the title of “palace of the King of Rome.” After the Battle of Leipzig in 1813, Percier and Fontaine were required to drastically cut back their plans. By 1814, as the Allies approached Paris, only the foundations had been built. After his escape from Elba, Napoleon ordered Fontaine and Percier to resume work on the palace of the King of Rome. That ended after Napoleon’s defeat at the Battle of Waterloo in 1815. On St. Helena, Napoleon claimed he regretted the project. In the sequel to Napoleon in America, Napoleon revives his plans for a palace for his son, this time on another continent. Emmanuel de Las Cases, Memoirs of the Life, Exile, and Conversations of the Emperor Napoleon, Vol. III (New York, 1855), p. 96. Charles Percier and Pierre Fontaine, “Napoléon Architecte,” Revue de Paris, Vol. 52, July 1833, pp. 39-40. Louis Constant Wairy, Recollections of the Private Life of Napoleon, translated by Walter Clark, Vol. III (New York and Boston, 1895), p. 154. George Sand, Story of My Life: The Autobiography of George Sand, edited by Thelma Jurgrau (Albany, NY, 1991), p. 428. “The Streets of Paris and Their Traditions,” Dublin University Magazine, A Literary and Political Journal, Vol. 67, No. 401, May 1866, p. 488. Barry O’Meara, Napoleon in Exile, or A Voice from St. Helena, Vol. 2 (Philadelphia, 1822), pp. 233-234. Emmanuel de Las Cases, Mémorial de Sainte Hélène: Journal of the Private Life and Conversations of the Emperor Napoleon at Saint Helena, Vol. 3, Part 5 (London, 1823), p. 157. A. & W. Galignani, Galignani’s Paris Guide, or Stranger’s Companion through the French Metropolis (Paris, 1822), pp. 202-203. Thanks, very interesting, as usual. Thanks, Geoffrey. I’m glad you enjoyed it. 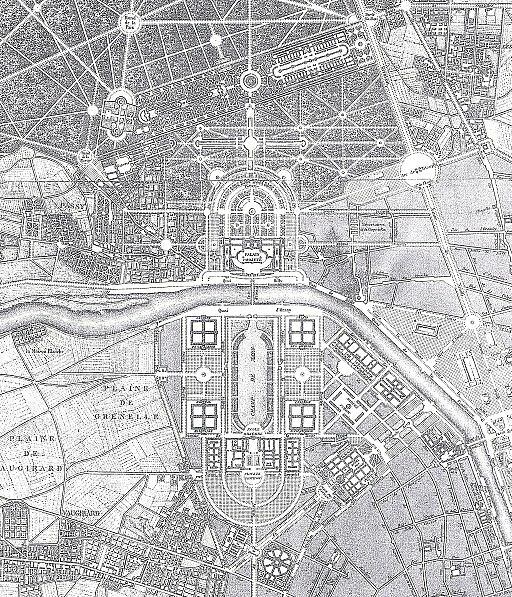 Hi Lauren – The map showing the planned location of the palace of the King of Rome at Chaillot was drawn by Pierre Fontaine and is part of the collection of the Bibliothèque Nationale de France. It is available online at Wikimedia Commons: https://commons.wikimedia.org/wiki/File:Plan_du_palais_du_roi_de_Rome_Chaillot.jpg. Those who can imagine a palace as extensive as Versailles...will not hesitate to think that this edifice could have been the most vast and most extraordinary work of our century.